The most popular Robert Simmons brushes are now in convenient matched sets. Each of these handmade, world-renowned brushes carries a manufacturer's lifetime guarantee. White Sable features a synthetic filament blend that simulates pure red sable. This brush is for all mediums. Signet is a Chungking Bristle brush for acrylics and oils. Use Titanium synthetic brushes with heavy-bodied acrylics and oils. Sienna is ideal for watercolor or decorative painting. Sapphire's superior quality blend of tapered synthetic filaments and fine European dressed pure red sable is great for fine art, watercolor, and decorative work. The smooth mixture of synthetic filaments makes Expression brushes ideal for decorative artists. Signet Pack N — This set contains four long handle Chungking bristle brushes: Filbert #2, Filbert #6, Flat #1, and Round #2. Signet Pack M — This set contains four long handle Chungking bristle brushes: Round #0, Bright #2, Filbert #3, and Flat #6. 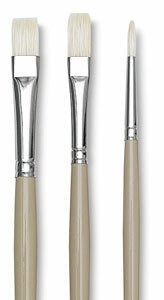 Signet Pack L — This set contains three long handle Chungking bristle brushes: Flat #2, Bright #4, and Filbert #5. 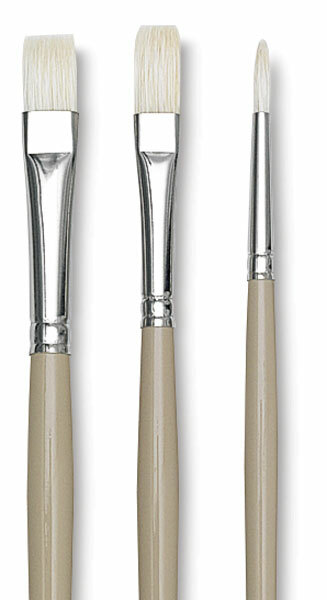 Signet Pack K — This set contains three long handle Chungking bristle brushes: Flat #4, Bright #6, and Round #1.